Note: The Second Great War is our alternative history setting in which the First World War ended with a negotiated peace that allowed the great empires – Austria-Hungary, Germany, Russia and Ottoman Turkey – to survive for another generation’s war. Our Second Great War at Sea books tell the story and present new scenarios from this war that never happened waged by fleets that never were. Tropic of Capricorn extends the story in the setting's first complete boxed game. South America’s naval powers played little role in the First Great War; none of the Latin nations had departed from their declarations of neutrality by the time Woodrow Wilson’s diplomacy brought an end to the fighting in December 1916. Disruptions to trade hurt the export economies of Argentina and Brazil as ships were diverted to carry munitions instead of coffee, while Chile suffered major financial losses when the August 1914 opening of the Panama Canal moved the world’s sea lanes away from her ports. With the return of peace came the return of trade, and all three economies prospered in the post-war boom period. As the 1920’s wore on, however, patterns developing in Europe began to have an impact in South America as well. The “Middle Europe” trading bloc of Germany, Austria, Poland, Bulgaria and Turkey prospered, and while the fascist economies of France and Italy did well in large part thanks to abundant Libyan oil, they could not match their explosive growth. By the 1930’s, Brazil’s social democratic government led by the young firebrand Luis Carlos Prestes had forged strong economic ties with their follow social democrats in Berlin and Vienna. With much more lax enforcement of labor laws, Brazil attracted German investment that helped spark industrial growth in its southern states. German airships flew regular routes to Brazil, and the Middle European bloc extended favorable terms to imports of Brazil’s sugar, cotton and textiles as well as coffee, helping to diversify the economy. The Brazilian Navy, meanwhile, grew very close to the High Seas Fleet, purchasing everything from new fast battleships through destroyers and airships from German builders. They also built a relationship with their North American counterpart thanks to an influential U.S. Navy mission. The fleet’s older battleships built in British yards before and after the First Great War went to the United States for thorough modernization along the same lines as U.S. Navy ships. And Brazil purchased new aircraft and cruisers in the United States. When the Second Great War broke out in Europe, Brazil declared her neutrality in concert with the United States. Cut off from their German trading partners, Brazilian businesses began laying off workers and exports piled up in dockside warehouses. But even as the economy suffered, the Prestes government refused to consider intervention in European affairs. Brazil had no formal alliance with either Germany or Austria, and only an informal understanding with the United States for cooperation against any attempt by outside powers to gain a foothold in the Western Hemisphere. Most Brazilians sympathized with the Central Powers and hoped for their victory, but few wished to actively aid their cause. The Argentine surprise attack of September 1940 changed that calculation, plunging an unwilling Brazil into the world conflict. Notes: Brazil’s “Old Republic” fell in 1930 as revolutionaries installed the losing candidate in that year’s presidential election, Getúlio Vargas, as president. Initially holding liberal sympathies, Vargas soon embarked on a fascist course as he assumed dictatorial powers. Brazil fought on the Allied side during the actual Second World War, but certainly did not count as a democracy. Luis Carlos Prestes had embarked on a military career in his teens but soon became a Communist revolutionary and led Brazil’s underground Communist Party for decades. In his old age he became a social democrat, and as a Brazilian patriot even forgave Vargas for the death of his Jewish wife (Vargas deported her to Germany, where she was murdered by the Nazis). In the world of Wilson’s Peace, the Bolsheviks are a forgotten footnote and Prestes has embraced social democratic values much earlier in life. The United States did send a highly influential naval mission to Brazil in the 1920’s, which proposed an ambitious fleet modernization program adopted by the Brazilian government. The Washington Naval Limitations accord prohibited signatories from building or modernizing battleships even for foreign customers, scuttling the battleship program. The effects of the Great Depression took care of its other elements. In the world of Wilson’s Peace, there are no German reparations or Weimar hyperinflation to fuel the Great Depression. There’s a recession in the late 1920’s, but nothing as dire as the economic collapse known to us. Brazil has the funds to modernize her fleet, and no international agreements forbid their doing so. During the 1920’s the Argentine economy surged, while the nation’s politics took a decided rightward turn. A number of European governments had taken advantage of Argentina’s relatively open immigration laws to deport anarchists and other radicals to the South American republic, and the “propaganda of the deed” terror campaign these new immigrants conducted unleashed a powerful right-wing backlash. By 1930, the fascist Liga Republicana had taken power behind President Augustin Justo, the former War Minister. The Argentine fascists already had great sympathies for their Italian counterparts, and these ties deepened in 1932 following the so-called Ottawa Conference. In response to the recession of 1929, Britain bowed to pressure from the Dominions, chiefly Australia and South Africa, to limit imports of Argentine beef. Fascist Italy, experiencing rapid economic growth following the discovery of oil in Libya, stepped in with an agreement to take Argentina’s beef and grain. The close relationship between the Justo and Mussolini governments includes a military-political alliance as well as economic ties. Argentina has modernized her first-generation dreadnoughts in Italian yards along the same lines as the older Italian battleships, removing their amidships heavy guns to fit much larger power plants to yield higher speeds. The Argentines have also constructed a pair of Littorio class battleships and purchased Italian battle cruisers, heavy cruisers and destroyers as well as aircraft. In September 1940, the Argentine fleet attacked a Brazilian squadron near Rio de Janeiro. The Argentines claimed to have intelligence that the Brazilians had set out to intercept a large beef convoy heading to Italy; the Brazilians asserted that this was nothing more than a well-advertised fleet training exercise. Central Powers intelligence analysts are of divided opinion as to whether the Argentines really thought Brazil meant to provoke a war and struck first, or if they launched their aggression without even that flimsy excuse. Whatever the reason, Argentina and Brazil have chosen their sides in the Second Great War. Notes: Justo did become president of Argentina in 1932, seen as the moderate conservative who could head off fascism. His predecessor, José Félix Uriburu, was an open fascist who died of stomach cancer before he could implement his full program. To keep Justo from turning to fascism, Britain agreed to modify its beef import quota system to include Argentina before Italy could step in with her own offer. In our modified history, Italy is a richer nation able to out-bid Britain, which really doesn’t want to buy Argentina’s produce anyway. And that leads to closer and closer ties between Italy and Argentina, already bound by culture and history. Argentina did look to Italy for many of her warship and aircraft purchases, though Argentine pride led them to spread their buying around rather than tie themselves to one supplier despite Italy’s easy credit terms and low prices. In the world of the Second Great War, Argentina has put that pride aside to buy Italian – both in terms of politics and hardware. Chile’s economy took some serious backward steps during the First Great War. She lost the maritime traffic diverted from the Strait of Magellan to the Panama Canal, her exports dropped (as did those of all primary-producer nations) as the warring states diverted their merchant shipping and their factories to their war efforts, and when German chemists perfected the Huber process to fix nitrogen from the air in 1914, her massive nitrate deposits became less valuable. The 1929 recession struck Chile much harder than other South American nations, with pay cuts leading to a mutiny in the fleet. The center-left government of Pierre Aguirre Cerda desires a neutral course in the coming conflict. Chile has an ongoing territorial dispute with Argentina in the Beagle Channel south of Tierra del Fuego, but nationalists also point to broader claims in Patagonia and the Northern Andes. British firms dominate Chile’s prime export sectors, copper and nitrates, and American financial influence is also strong. Chile has strong sympathies with Britain, but no formal (or even informal) alliance. The Chilean Navy maintains its century-long special relationship with Britain’s Royal Navy, and its major units have been reconstructed along the same lines as their British near-sisters. Chile’s wealth has declined relative to that of Argentina and Brazil, and the fleet has made fewer purchases of new warships than its rivals. The Navy lost a great deal of its political influence following the 1931 mutiny, but has obtained a few modern warships. A division of big modern destroyers has joined a pair of modernized British-built dreadnoughts and two Italian-built fast armored cruisers. Notes: In our reality, Chile suffered not only the triple economic shock described here, but also a devastating blow from the Great Depression as prices for its exports plummeted. The fleet indeed rebelled over pay cuts, and the Navy has never regained its prestige. That could be remedied with a successful war against the pompous, arrogant Argentines. Chile remains neutral as Argentina plunges South America into the Second Great War, but her military and political leaders are ready to abandon that stance if a favorable opportunity appears. The weakest of the South American naval powers, Chile is not in a position to challenge mighty Argentina by herself. And that’s the basis for Tropic of Capricorn. 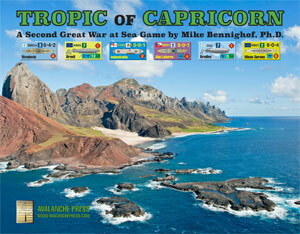 Don’t wait to put Tropic of Capricorn on your game table! Join the Gold Club and find out how to get it before anyone else! Mike Bennighof is president of Avalanche Press and holds a doctorate in history from Emory University. A Fulbright Scholar and award-winning journalist, he has published over 100 books, games and articles on historical subjects. He lives in Birmingham, Alabama with his wife, three children, his dog, Leopold and Egbert the pet turkey.